They say a bad day of fishing always beats a good day at work. Lucky for me, this past weekend, I didn't have to argue that point, as I had a great day o'fishing, despite my apparent, inadvertent attempt to sabotage it! I must say, despite living in Maryland for a half-dozen years or so, I've never had the opportunity before this to find myself on a charter boat, embarking on "big fishing." 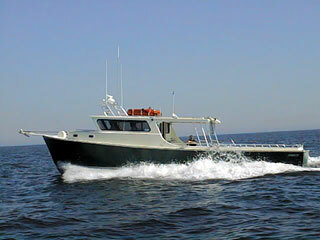 We're not talking little white perch off the shore fishing, but real, out-in-the-Chesapeake-Bay fishing. Fishing for Maryland's state fish ~ rockfish, also known as striped bass ~ was an excellent place to start. Well, we could have asked for one more thing. This Midwest girl really should have been instructed on the do's and don't's of what you may bring on a boat, especially when it comes to the superstitions of watermen! We had copious amounts of water--check. Sunscreen--check. Snacks galore--check. Yet, it was in the snack portion of the trip, that I hit the snafu. Mid-morning (well, probably 7:20 given my perception of time being skewed with our early wake-up time), I pull out a snack. I whipped out of my bag a banana. It was then that I noticed my error--as was evident from the looks of terror from all of my companions. One bite in, I learned that a banana was THE WORST thing I could have brought aboard, and now I've risked the fate of our whole catch. Um, hello! First-timer here! Midwestern girl! Improperly informed! Sure enough, posted there was a "no banana" sign on the boat's window (first I'd seen of it!). Old maritime lore has it that back-in-the-day of wooden galleons and exploration times, stops along newly found islands would bring about all sorts of exotic new finds: like bananas. When bringing bananas on board to take back said-finds, you'd also be unknowingly-transporting all sorts of poisonous critters like spiders and snakes that would hitch a hidden ride. Then, once onboard, the vermin would multiply, and do what poisonous vermin do, bringing detriment to all aboard. It is doubtful that my solo banana from the produce section at Giant would elicit such results, but from the aghast of the group as I was one bite in, I knew that "being uninformed" was no true excuse! Fretful that I had now cursed the boat, I was dumbfounded, holding my open banana, wildly asking, "What do I do? What do I do?" General consensus--"Get rid of it!!" Not being one to litter, but more largely fearing mutiny, my banana went sailing through the air with a mighty splash in the sea. A few fish below, no doubt, were happy with my error (and my mega-flying-banana shot overboard!). It was about then that I began praying to Neptune, Roman God of the Sea. Well, despite being called "Del Monte" and "Chiquita" for the rest of the day, the story has a happy ending. We caught our bait fish (a barrel full of spot), headed out, and (phshew! wipe my sweaty brow) Neptune was smiling on us. 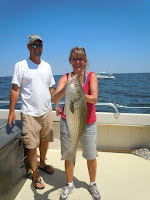 During the course of the morning we caught our allowed 2 rockfish per passenger. Those are some mighty strong fish, let me tell you! We had a great day on the Canvasback (thanks Capt. Brian and First Mate Kenny)! Pretty cool experience for this corn-belt-Midwestern girl! Even better, was dining that night on a scrumptious filet of rockfish that we'd caught ourselves, seasoned and grilled to perfection. Accompanying the fish, the baked squash that was hand-picked just prior to dinner from our garden was tasty. As was the luscious tomatoes we picked up from a roadside stand on the drive home. We were true locavores, hunters and gatherers. We'd lived off the land, and boy oh boy did it taste good! Yep, the makings of a perfect day...despite the banana! Pics from http://www.fishthebay.com/ and my camera from Sunday, July 17th.